Why should I apply to this program, rather than a program somewhere else? The UBC Horticulture Training Program (HTP) is the only full-time horticulture training program in Metro Vancouver north of the Fraser River. UBC Botanical Garden provides a rich training environment for the program. Instruction is fully integrated with horticultural activities in the Garden and garden staff participate in training and mentoring. Why should I study at UBC Botanical Garden? UBC Botanical Garden’s wide range of facilities provide learning opportunities on the Botanical Garden grounds, Botanical Garden Nursery, Nitobe Memorial Garden, Totem Research Fields and Horticulture Greenhouses. The gardens and facilities are beautiful environments for practical learning and the program provides excellent opportunities for students to train alongside our industry-leading horticulturists. Visit our Application Process and Fees page for details on how to apply. Applications are due May 1st each year. The application fee is $250 CAD, which can be paid by cheque or credit card. For students that are admitted, $200 will be applied to tuition for the first module. Unsuccessful applicants will be refunded $200 of the application fee. Tuition is $4000 CAD and material fees are $1500. Total cost is $5500 CAD. In addition, students are responsible for their own hand pruners (Felco secateurs), rain gear, safety boots, work gloves, textbooks, academic supplies, transportation and entry fees for field trips. Please note that although this course is run through UBC Botanical Garden, students do not pay UBC student fees or receive a UBC Student card or benefits. Is there financial aid available to students? While there are some different avenues for funding, our program is not approved for government student funding. There is apprenticeship funding you can apply for after completing the program, and depending on your eligibility, past students have gone through WorkBC and WorkSafe for funding. What if I withdraw and want to resume studies? Enrolled participants who do not complete the four modules in sequence may be charged an additional application fee if they wish to resume studies. What will I learn in the HTP? The HTP is an entry-level program that introduces students to the fundamentals of landscape horticulture. The program follows the provincial horticulture apprenticeship enriching the base curriculum with supplementary materials and practical, hands-on activities and training. Is the HTP a provincially recognized program? Yes, the HTP is provincially accredited. 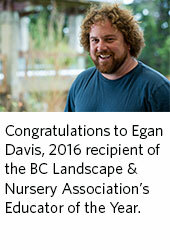 The University of British Columbia is recognized as an Industry Training Authority designated training provider in the Landscape Horticulturist Program. The program is endorsed by the Industry Training Organization, HortEducationBC. Does the HTP give me credit in the BC Horticulture Apprenticeship? Yes. Students are required to register as apprentices. Successful completion of the HTP gives credit for the classroom portion of Levels 1 & 2 of the provincial horticulture apprenticeship. Students are assessed on proficiencies in horticultural knowledge and practice through a variety of methods including oral, written and practical assignments and a complete final evaluation at the end of each course. Course failure within a module requires the student to repeat the course the next time it is normally offered. Failure of more than three courses within a module requires the student to repeat the entire module. A passing grade of at least 70% is required on all assignments, tests and courses to complete the program successfully. The HTP is comprised of four, separate eight-week modules. The program begins on the Tuesday after Labour Day and finishes in April (ex: September 3, 2019-April 24, 2020). Each module is approximately 275 hours of classroom and practical instruction and is composed of a series of 3–5 courses. The HTP is limited to a maximum of 16 students per cohort. We accept one cohort per year with classes starting in September. All other qualified students are placed on a waitlist and may be offered a seat should they become available before the start of the cohort year. Can I take the program on a part-time basis? HTP is only offered on a full-time basis as classes have been designed to complement each other and build on learning objectives and hands-on activities. Can I work while taking the HTP? The HTP is a full-time program. Students are required to attend Monday to Friday from 8:00am-4:30pm. The physical nature of the training, as well as assignments and readings, significantly reduces available time and energy for extra-curricular activities. What kinds of jobs are available to graduates? Are there guidelines for student conduct? Students are expected to abide within UBC policies on Academic Freedom, Academic Honesty and Student Conduct. No, student housing is not available at this time.